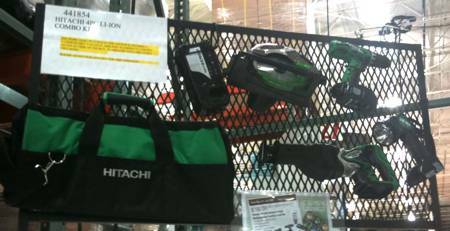 Currently viewing the category: "Costco"
This month, Sears began selling Craftsman tools through Costco club outlets, including hand tools, power tools, and tool storage units. It’s not the first time the company has sold its products through potential competitors — K-Mart picked up Craftsman products after the companies merged*, and Orchard Supply Hardware in California, Fastenal retail outlets, and AAFES all carry Craftsman. Even a number of ACE Hardware stores recently started carrying the line. Sears is reaching out essentially to one of its own major competitors — Sears Holdings is ranked #10 on the National Retail Foundations’s Top 100 Retailers list. Competitors Home Depot (#5 on the list) and Lowe’s (#8) still don’t cross streams with Sears, but Costco’s in the top ten, too, at #6, doing almost double the retail sales in the U.S. and worldwide last year. 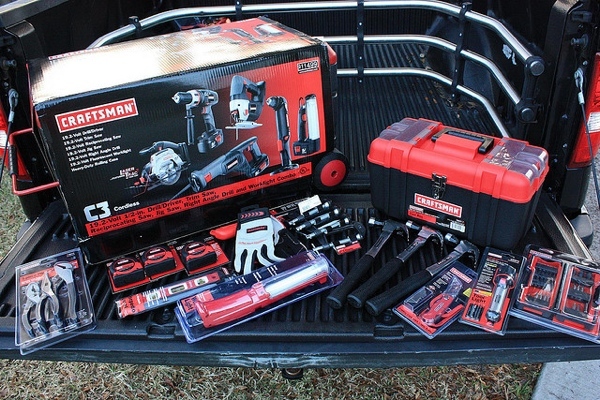 And now, by the end of the year, all 430 Costco outlets will carry the Craftsman line. I saw this kit Saturday at our local Costco, marked down to $80 from $100. While I didn’t look super close because I have more hand tools than I know what to do with, it did occur to me that this might make a pretty decent gift for a friend that doesn’t have any tools at all. 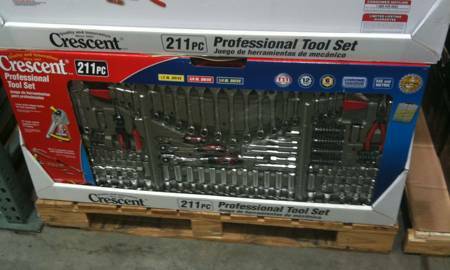 It looks like a surprisingly good selection, and I’m particularly happy they chose to include an adjustable wrench. You’d be surprised how many basic sets forget one, leaving poor buyers screwed if they run across a nut or bolt outside the range of the included sockets and wrenches. Another Costco score, this looks to me like the 18V set that normally retails for around $399 in most places — and if it’s different, I’m not sure that the differences would make that much difference for homeowners. We’ve had our hands on a number of different Hitachi drill/drivers and they’re not bad at all, as long as you can get used to the Halo plasma pistol styling. This might make the perfect gift for a brand-conscious tool friend this holiday season. 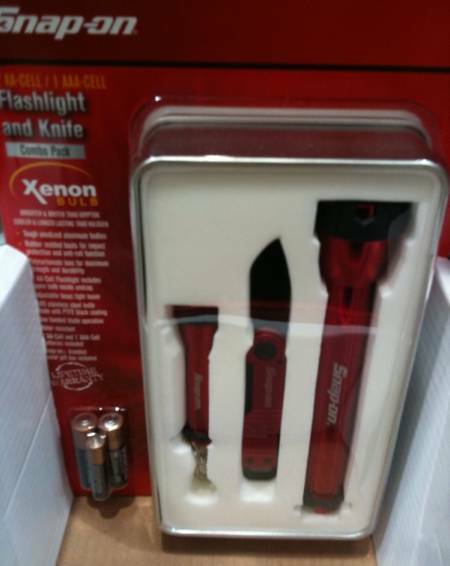 This flashlight and knife kit (on sale at Costco this weekend) includes all the necessities: an aluminum barreled, xenon-bulbed two-AA light, a miniature AAA model, and an aluminum-bodied folding knife — and, of course, the Snap-on brand prominently on display. The Eagle has landed — in your backyard. 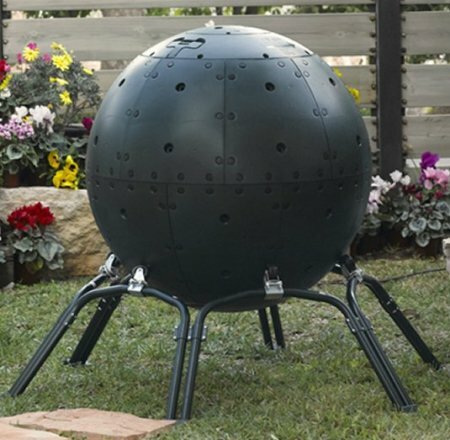 Well, okay, if you don’t believe the black sphere pictured above is spaceworthy, maybe you’d believe it’s a giant hamster ball for your dog? It turns out that it’s actually the ECOmposter, a compost bin. The ECOmposter is constructed from recycled materials. The spherical shape maximizes the ratio of surface area to volume, which in layman’s terms means it’ll hold heat better. This shape, coupled with the dark color and the 16 integrated air tubes, helps the compost decompose faster, possibly even in as little as 4-6 weeks. The spherical shape also lets you roll the bin in any direction, mixing the compost more evenly. There are openings on both the top and bottom for adding or retrieving compost. The ECOmposter comes with either a short plastic base or a taller tubular metal base with rollers that lets you rotate the ball in place. It looks like one of the best prices comes from Sam’s Club, where it’s just $150. If you’re not careful you could pay up to $300. Who doesn’t need more space in their garage? Whether it’s that extra car that sits outside, all your lawn care equipment, snowmobiles, or ATV’s, there never seems to be enough room for it all. 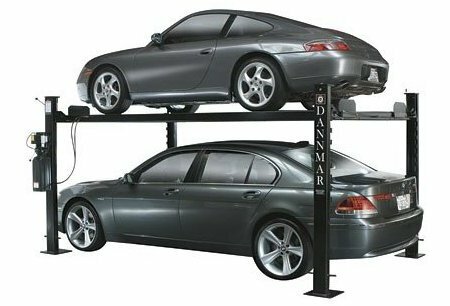 With these four-post lifts from Dannmar you can recover that wasted space above your vehicles to store your stuff. Hell, you could even set up your shop on the lift and raise it out of the way when you need to park your vehicle — how sweet would that be? 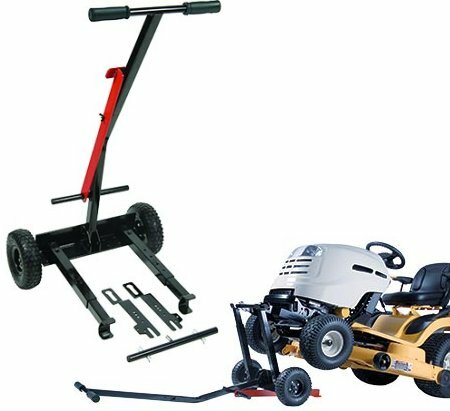 You can easily tip over a push mower to access the underside of the deck and the blade — trying this with your riding mower probably won’t do it or your back any good. This tractor lift from Ohio Steel raises and holds the front end of the tractor in the air so you can do maintenance underneath. 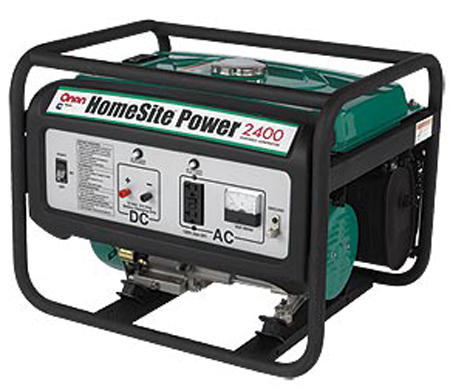 If you have a Costco membership (or are thinking about getting one) this is for you: Costco is offering a $200 off coupon on this Cummins Onan HomeSite 2400 portable generator. It features a 4-gallon tank, which Cummins claims is good for 13 hours of operation, and a 6.5 HP 4-stroke engine which outputs 2,000 watts of power. It also has GFCI protected AC output and DC terminals and an automatic low-oil shutdown feature, and it comes with a 2-year warranty.